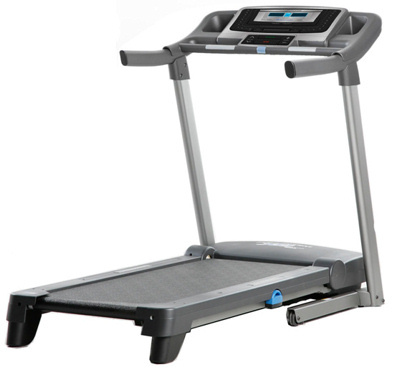 The Proform 5.5 CrossTrainer is a great treadmill to shed some pounds and get in shape. It is one of Proform’s newest models for 2008. It has features and programs that many treadmills under $800 don’t. The Proform 5.5 CrossTrainer comes with the iFit® feature, which is a challenge training center. This feature enables you to run through a built-in fitness assessment, and then it creates customized workout plans based on your results. Cross Trainer 5.5 features 24 Interactive CrossTrainer workouts, which include a variety of strength training exercises, with fantastic cardio workouts. Other features include: a Dual-Grip EKG Heart Rate monitor, 0-10 MPH Precision QuickSpeed, 0-10% Quick Incline, and the innovative iFit Challenge Training Center. The 5.5 CrossTrainer will also give you a healthy eating guide, including a 1400, 1800 and 2200 calorie meal plan. Not many treadmills come with complete workout plans, such as the Proform CrossTrainer 5.5. Why choose the CrossTrainer 5.5 over other treadmills? It will not only help you loose weight, Proform 5.5 will also keep you motivated by exercising with multiple workout programs, and educate you about healthy foods. Proform 5.5 CrossTrainer is very comfortable to exercise with, due to the AirTech™ Impact-Reducing Cushioning, which results in less stress on ankles, knees and hips. What are the weaknesses and strong points of using CrossTrainer 5.5? This treadmill is an economy machine, but with its price range, it is expected to have limitations, such as speed range and incline. This treadmill is ideal for walkers only, not runners, as it would not last long. Even though it has some great features, it is an economy treadmill, which requires to be treated gently and is not ideal for heavy use. 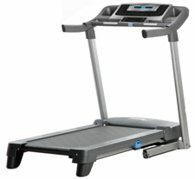 You can buy the treadmill at discount price of $799, directly from the manufacturer and save on shipping and sales tax. Step up your joint protection with AirTech™ cushioning, uniquely designed to offer maximum workout comfort, while reducing impact on your joints. Make the most out of every workout by monitoring your heart rate, with these sensors that are built into the handlebars, ensuring you're always in the right training zone for your goals. Melt fat, build muscle and eat well with the iFIT® Challenge Training Center. Featuring a built-in fitness assessment, the ifit® Challenge Center assigns you a monthly exercise program and comes with 3 Healthy Eating Guides, including a 1400, 1800 and 2200 calorie meal plan. Now, you can see your preferred workout information, such as calories, distance or elapsed time, at nearly 1" tall. This console can also visually display your heart beat or an animated figure walking, jogging or running through your workout with you. The Grafixx™ display also displays all training information for the iFit Monthly Challenge. Buy with confidence! This treadmill features a 12-year motor warranty and 1 year of parts and labor. The Proform 5.5 CrossTrainer treadmill offers unique features that can help you reach your fitness goals and develop healthy lifestyle. The iFit® Challenge Training Center is a great built-in fitness assessment and offers customized workout plans. There is no need to second guess whether you are on the right track, as far as healthy eating and workout plans goes. Everything is prepared for you and you can choose from 24 built in crosstrainer workouts. However, this treadmill is ideal for walkers only. It is an average treadmill, not a commercial grade treadmill. If you’re planning to only walk, then this treadmill is the right choice for you. But, if your workout consists of running and walking, then this treadmill isn’t the perfect choice for your workout needs. Proform 5.5 CrossTrainer is a great option.